Mining project studies and their evaluation are characterised by high uncertainties. These uncertainties range in magnitude from, and are prevalent in, the geological data on which the project is based, through to the final prices received for the ore, metal, or mineral being sold to the market. The process for managing uncertainties in mining projects could have a huge impact on the decision about the final option and on the project composition. It is therefore critical that a systematic process is followed that manages these uncertainties effectively and consistently throughout the project phases, and when evaluating various options one against the other. This paper discusses the results of an investigation to determine the extent to which risk management was applied in twenty different project studies in the mining environment. The results of these studies indicate that uncertainties relating to typical mining project studies are not well understood or managed. A process to manage these uncertainties throughout the project development phases was developed and used in a typical pre-feasibility study. The results indicate that the process can be successfully implemented; and that the process helps to develop the project faster by focusing the project teams most on the uncertainties that affect the project need or requirement. Projekstudies in die mynboubedryf en die evaluasie van sodanige projekte word gekenmerk deur hoë onsekerheid. Hierdie onsekerhede wissel in grootte, en is teenwoordig vanaf die geologiese data waarop die projek gebaseer is tot by die finale prys waarvoor die erts, metaal, of mineraal verkoop kan word. Die proses wat gebruik word om die onsekerhede in mynbouprojekte te bestuur kan 'n groot impak hê op die uiteindelike opsie wat gekies word en die samestelling van die projek. Dit is derhalwe van uiterste belang dat 'n sistematiese proses gevolg word om die onsekerhede effektief te bestuur deur die verloop van die projekfases en wanneer alternatiewe met mekaar vergelyk word. Hierdie artikel bespreek die resultate van 'n ondersoek wat gedoen is om te bepaal tot watter mate risikobestuur toegepas is vir twintig projekstudies in die mynbou-omgewing. Die resultate van hierdie navorsingsprojek in die mynboubedryf het aangetoon dat die onsekerhede met betrekking tot tipiese projekstudies in mynbou nie goed verstaan word deur bestuur nie. 'n Proses om hierdie onsekerhede deur die loop van die ontwikkelingsfases van die projek te bestuur is ontwikkel en toegepas op 'n tipiese voor-doenlikheidstudie. Die resultate toon aan dat die proses suksesvol geïmplementeer kan word en dat die projek vinniger ontwikkel kan word deur die projekspanne te fokus op die onsekerhede wat die behoefte van die projek die meeste beïnvloed. Paulos  stated, "Uncertainty is the only certainty there is, and knowing how to live with insecurity is the only security". This quote rings especially true in the environment of project studies, and even more so in mining studies. These studies are typified by long implementation periods, highly volatile revenue (commodity) prices, and unpredictable escalation forecasting. Uncertainties that relate to mining studies are evident throughout the various disciplines involved. Uncertain events, as well as uncertain values of project variables - such as cost, duration, and performance of individual activities - contribute towards an overall uncertainty about the total cost and duration of projects. Uncertainties, as in any typical project, can have either positive or negative effects on the final project evaluation, and therefore on the final project selection. The magnitude of the risks and the frequency of their occurrence varies, depending on the project and the project phase and definition that is required according to the relevant project lifecycle process. Evaluating mining project studies has therefore become an area of intense debate, as varying assumptions made by independent project teams often lead to different results. The top management of companies obviously wish to make the right choice of projects to enhance the probability of project success. The use of project risk management can improve project success; but as Borge  says, "risk management is not a magic formula that will always give the right answer; it's a way of thinking that will give better answers to better questions". Uncertainties (risks and opportunities) should be identified, managed, and controlled effectively and consistently. The integration of these disciplines and their uncertainties are critical in ensuring that the maximum possible value is realised by the project. The flowchart in Figure 1 indicates the integration of these disciplines throughout a typical mining study. Geology is the foundation for all mining projects. Geology and commodity pricing can also be considered as the only two aspects of a mining project that cannot be influenced by a project team. Geology is also the discipline that needs to lead the others, and for obvious reasons has the most influence on the decisions and the designs of the other disciplines. Typical uncertainties that the project and subsequent disciplines need to consider include the structural and mineralogical make-up of the ore body. The mining discipline, which follows the geology, starts with the basic mining methods for the ore body that has already been defined. This initial work defines the final structure and infrastructure backbone requirements of the project. When the mining method and layouts have been defined, the process of defining and detailing the infrastructure required to service and support the mining method can begin. All general engineering disciplines are involved in this detailing, including mechanical, electrical, and civil engineering. Once the project has been defined from a technical perspective, the techno-economic evaluation can be performed. During this phase, the output from each of the other main disciplines provides the inputs for the financial evaluation. Using assumptions about the pricing of commodities, escalation forecasts, etc., the project can then be evaluated using the net present value (NPV) technique. However, projects can never be evaluated on their own financial benefits, expressed as an NPV. Projects are executed within organisations, and the net financial effect on the financial performance of the company needs to be considered in the decision-making process. The difference between the NPV for the company (including other projects) with a new project included, and the NPV without the new project, should therefore be evaluated and used in the final decision whether or not to proceed. This process also requires a fair amount of iteration to ensure that the project delivers the maximum value for the shareholder(s). This iterative process can significantly prolong the study phase of such projects. What are the typical uncertainties involved in mining projects? Why should uncertainty (including risk and opportunity) management be undertaken in mining projects? Which of the techniques for identification, evaluation, treatment, and monitoring should be used within the uncertainty management process for typical mining projects? How should uncertainty be managed in a typical mining project? How should the uncertainty management process be implemented throughout the project life-cycle? Numerous authors have published processes and techniques for the management of uncertainty in projects. The majority of these processes are extensions and modifications of existing risk management processes, and focus mainly on uncertainties that affect the project outcomes negatively. All of these processes use the same basic process structure described by Meredith & Mantel . This structure is similar to the process used by the PMBoK Guide , the AS/NZS 4360 risk management standard , and the ISO 31000 standard on risk management . It is illustrated in Figure 2. Due to the terminology of risk and uncertainty management presented by these guides, the perception is created that uncertainty management is limited to the management of adverse consequences that impact on projects . This perception limits project teams to focusing on issues and effects that threaten project success; thus opportunities for improving the project outcomes are neglected and, in many projects, totally ignored. 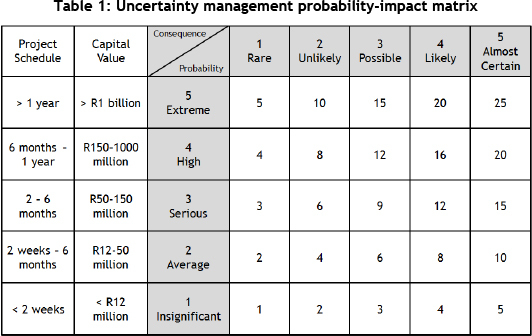 Chapman  argues that all organisations involved in extensive risk and uncertainty management should develop their own processes to manage these aspects. These processes can, and should, be based on the processes described in any of the various guides listed above. Hillson  describes the application of the PMBoK risk management process for the management of risks and of opportunities in projects. He argues that, although in certain instances risks and opportunities could be managed separately, a single process can effectively be used for the management of all uncertainties (risks and opportunities) in projects. This process should therefore form part of the overall project management function. However, Jaafari  argues that project management practice needs to make a fundamental shift - away from task and activity-based approaches, to a more strategy-based management, where risk and uncertainty management should form a core function within this approach. Jaafari  argues that project management should be approached from a lifecycle objective function perspective, and that this should drive risk reduction and opportunity increases in projects. The first phase, the literature study, was discussed in the previous section. The other two phases are briefly discussed in the next two subsections. This investigation was done on 20 mining project studies completed between 2002 and 2012. These studies were selected from a large pool of project studies completed by a single contractor in the mining industry. Although the data was gathered from a single contractor, the risk management processes used in these projects could be regarded as an accurate portrayal of the risk management process used for projects throughout the mining industry. Data for the 20 selected projects was available for different life stages. For three projects, some data was available for two project stages. For the purpose of this study, the data can be treated as 23 independent projects. The third phase of the research study involved applying the proposed uncertainty management process to a test project. A pre-feasibility project study was selected as the test project. Due to the nature of pre-feasibility studies - where the main purpose is to investigate various options and finally recommend the option that should be detailed during the feasibility phase - this project phase should be the one where the proposed process can add the most value. The 20 projects varied in size and complexity from small projects with overall capital costs of R500 million to large projects with total capital expenditures exceeding R15 billion. Figure 3 indicates the distribution of the number of projects, evaluated as a function of various capital expenditure ranges. The different phases of the projects are also indicated in the legend. Some projects were evaluated for more than one phase for which data was available. The bar chart therefore indicates 23 data points for the 20 projects that were evaluated. Figure 3 indicates a spread in respect of the capital expenditure, with two or three projects in each cost bracket. There were no projects of more than R10 billion for which data was available for the pre-feasibility studies phase. 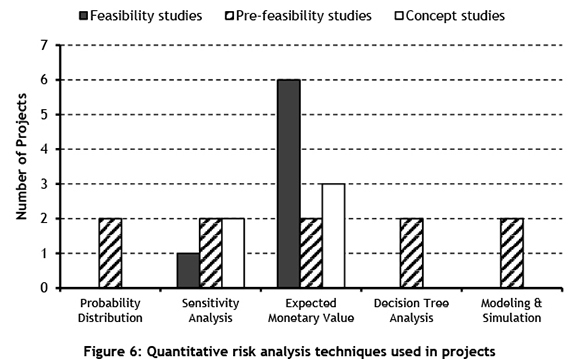 Various methods or techniques to identify risk events are discussed in the literature; brainstorming and interviewing are probably the most well-known in project risk management. Respondents were asked to indicate which techniques were used on the project; the results are shown in Figure 4. 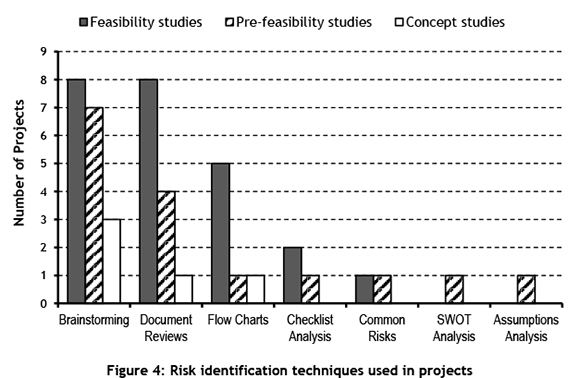 It is evident from Figure 4 that some projects used more than just one technique to identify risks, especially during the feasibility stage of the projects. The strengths, weaknesses, opportunities, and threats (SWOT) analysis technique is often used to identify strategic risks in a company or projects, but only one project used this technique. The second most frequently used method for identification was documentation reviews. These reviews were done on completion of the project study phases, and highlighted any shortcomings and uncertainties that could not be identified by the project teams due to possible 'industrial blindness'. The documentation review technique proved to be beneficial in ensuring consistency in the quality of the information reflected in the project study reports, including the risk management processes. The documentation reviews do, however, rely on the availability of key personnel who, through their experience, can highlight any potential issues or shortcomings. Interviewees from the 20 projects were also asked to indicate whether opportunities were identified as part of the risk identification process, or elsewhere. All of the projects investigated, however, showed that opportunities were very poorly identified. Only one of the projects indicated any identified opportunities, and they all related to possible capital cost savings. The perceptions of the project personnel interviewed also indicated a general misconception about the subject of uncertainty management. The majority of the project personnel interviewed did not show any awareness about identifying opportunities relating to the project studies. It is the opinion of the authors that this misconception is primarily driven by the impression that the project teams have about the mining legislation, which requires issue- and task-based risk assessments for work before the work can be undertaken. These assessments are traditionally focused on identifying possible situations or issues that could injure personnel, damage property, or prevent the successful completion of the tasks required. In most of the projects, brainstorming sessions were only scheduled towards the latter half of the particular project study phase. This approach prevented the project teams from managing and mitigating the identified risks timeously, and this information could only be used in the project phase that followed on the one investigated. This approach sterilised certain opportunities that could have significantly improved the project - and, furthermore, it did not mitigate high risk issues at a stage in the project when potential changes in scope and planning would have had minimal impact. The tools and techniques that were used on the project studies to complete the qualitative risk analyses are indicated in Figure 5. All the project studies investigated indicated the use of probability impact assessments in conjunction with probability impact matrices. These techniques have been well-developed within the mining industry, and are specifically used to identify safety, health, and environmental (SHE) hazards, and unwanted events. A number of projects also used the categorisation assessment technique that is used in conjunction with other methods. The techniques used for quantitative risk analysis are indicated in the bar chart in Figure 6. Most of these techniques are mentioned in the PMBoK guide . Twelve of the project studies that were investigated used the expected monetary value (EMV) technique to calculate the contingency required to complete the projects successfully. The data used in these was triangular probability distributions that indicated optimistic, most likely, and pessimistic values. Two of the project studies also used statistical data from previously executed projects and well-developed financial and economic indicators, in conjunction with the data collected from the workshop. A Monte Carlo simulation was then used to calculate the required contingency for the capital expenditure. Wood  and Schuyler  provide guidance in performing cost risk simulations. The proposed uncertainty management process was developed by attempting to 'look back' through the study process from the final deliverable perspective. The process is therefore primarily outcomes-based; and through its application it attempts to focus the project study team's thoughts and all other processes on the final deliverable. The accuracy of these final deliverables is directly impacted by the accuracy of the basic parameters used to evaluate projects. The accuracy of the final project study deliverable, which normally is the projected net present value (NPV) and internal rate of return (IRR), should be expressed as a function of the individual input parameters. Using this deliverable and basic parameter accuracy requirement as the basis for the development of the new uncertainty management process, the authors propose that uncertainty management should form the basis (backbone) of the project study phase. 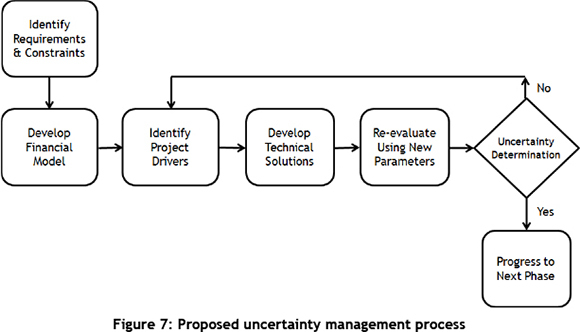 This proposed uncertainty management process is illustrated in Figure 7. By taking account of uncertainties relating to the various alternatives, the process of modelling all possible project alternatives makes it possible to identify the project alternative that has the highest probability of achieving success. These modelling and simulation techniques are the basis for developing options throughout the project study, and for final project selection and evaluation. The proposed process helps the project team to focus on the final project phase deliverables. As well as defining the deliverables of the project phase, the process should decrease the time required to complete the project study phase, as unnecessary time spent on options and derivatives that do not increase the final value of the project or accuracy of the study phase deliverables can be rapidly discarded. The various sub-processes shown in Figure 7 are described briefly below. It is important to identify and define the project requirements, assumptions, and constraints to ensure that the project objectives and deliverables are achieved. The requirements for the project (needs) should be well understood and quantifiable so that the project team can apply the proposed process. The traditional primary requirement for a project in the mining environment is the need to increase shareholder value, and therefore to maximise the net present value (NPV) or the internal rate of return (IRR) for the projects and for the company. This requirement can be accurately quantified by describing the project by means of a financial model that calculates the forecasted project NPV and IRR. The impact on the company NPV should also be determined and considered in the decision process. Assumptions and constraints need to be quantified from the start of the project study to ensure that these can be incorporated as 'boundaries of investigation' into the model representing the project study. A model is developed with the ultimate project requirement as an output. In general, this model will be based on a financial model with the project NPV as an output. The inputs for the model should include the assumptions and constraints that were defined during the initiation phase. These need to be represented as uncertainty ranges with the limits defined by the constraints and assumptions. The model also needs to define the major technical attributes of the proposed project. It is important, however, not to over-define these attributes, as this could prevent the realisation of the highest potential project outcome. These technical values should not be restrained by traditional achieved technical outputs, as this could also prevent the project from realising its highest possible output value. Once the project model has been defined with the various uncertainties, constraints, and assumptions defined, a Monte Carlo simulation (MCS), described by Wood , can be performed. Using this model, the assumptions and constraints that have the biggest influence on the project outcome (NPV) can be determined using the correlation coefficients for the various inputs. The project team should focus on the technical constraints with the highest correlation coefficients, as these have the highest likelihood of improving the project NPV. Conversely, the negative risk associated with these highly correlated inputs needs to be mitigated, primarily to ensure that the highest potential NPV can be achieved. Once the uncertainties have been identified and ranked as described above, the next step is to develop technical solutions (plans) to further define and optimise the model input values that were defined during the identification phase. Should it be necessary to evaluate alternative technical solutions against one another, this can be done through the development of a decision tree analysis, as described by Schuyler . The modelling and evaluation process should be completed for each option, and finally weighed one against another to determine the optimal alternative. Once the technical solution has been further defined and the inputs of the model have been adjusted accordingly, a re-run is performed. The probability distributions of the major project aspects are then recalculated. Generally, project studies have to comply with requirements defined by the client or by industry norms to complete a certain study phase. These requirements are functions of the accuracy and definition of the various aspects of the project. If the project does not comply with these requirements, the project should be returned to the third step in the process: the identification of the major drivers. The project should then progress again through the various steps until the requirements have been fulfilled. This iterative process occurs naturally, but in an uncontrolled way, during project studies. Using the process proposed here encourages the project team to proceed with these iterative processes in a controlled manner. This process will also ensure that the client's expectations about the project are maximised by continually referring back to the model that describes the project. Risk management is used extensively throughout the mining and project management industry, mainly due to the focus on safety risk management in the mining industry. Existing techniques and methods in the various sub-processes were used and slightly modified to ensure acceptance by the various project teams. The requirements and constraints of the mining study that is being developed are normally defined and listed within the charter of the project. An additional clarification session should be held with all project stakeholders to ensure that alignment and agreement is obtained before the study begins, and to ensure that the correct requirements and constraints have been identified. As discussed earlier, the main purpose for executing a mining project study is to identify and develop mining studies to maximise or increase the financial value of a mine or mining company. For this reason, the financial evaluation process is the most critical part of the proposed process. The financial evaluation should use a model that is specifically developed for the project. This model should be developed so that all uncertainties can be represented and the impact on the financial outcome determined. These uncertainties can easily be incorporated into the financial model by using probabilistic costing methods, such as the Monte Carlo simulation method. Computer software like Crystal Ball , @Risk  or something similar can be used for the cost simulation. Risk identification in a typical mining environment is done using brainstorming workshops with project team members, subject-matter experts, and various personnel involved in the day-to-day management of the system being assessed. It is therefore recommended that the process used to identify the uncertainties on the project use this same technique, ensuring that the team members involved are focused on identifying various uncertainties. The same methodology of using existing familiar techniques that are currently being used within the industry will be applied to the qualitative uncertainty analysis sub-process. The technique that is currently used successfully throughout the mining industry is the probability-impact matrix assessment. The typical matrix should, however, be modified to focus on uncertainty rather than only on threats. This matrix is indicated in Table 1. The numbers in the risk matrix represent a risk ranking, with 25 being the highest and 1 the lowest ranking. This matrix allows the risk to be ranked, to determine the most important (critical) risk events that require further attention and treatment. The technique used for the quantitative uncertainty analysis for project evaluation purposes is the Monte Carlo simulation. Such simulation techniques have proved their value in various industries, and have been used very successfully in a very limited manner in the techno-economic evaluation of mining projects in recent years. In order to test this process, a pre-feasibility study was undertaken, using this process as the basis. The process steps are discussed in more detail below. The primary requirement from the client, on whose behalf the pre-feasibility was undertaken, was to ensure that the project returned the maximum possible net present value (NPV). This requirement would therefore be the final output of the model that had to be developed. In this case, the client had a well-developed set of macro-economic values, including future forecasted values. These values were used directly in the financial model that was developed. These constraints were then all quantified, and the uncertainties that would be applied to all of these were agreed with the client. A financial model was then developed, based on the discounted cash flow (DCF) method with all the requirements, assumptions, and constraints captured. This model was then verified against a benchmark model used by the client to ensure that the output information was accurate. The benchmark model of the client could not accommodate any form of uncertainty, and all input uncertainties in the model developed had to be modelled with single values. The two models, however, correlated accurately, and the financial model could therefore be accepted as accurate. This model was then used to identify the major drivers of the project. 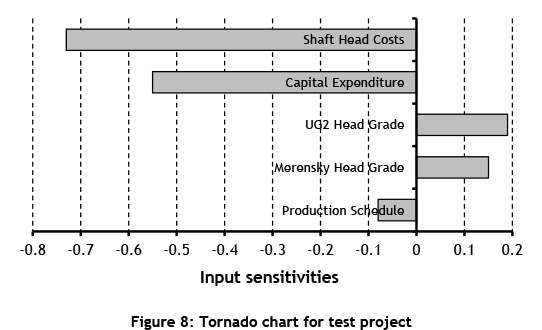 A tornado chart or graph can be used to visualise the effect of a change in the value of an input parameter on the change in the output of a model. The input parameters of a model should be selected as independent parameters if possible. However, quite often some input parameters or variables of a model are not independent or uncorrelated, and the extent of dependence can be expressed as the co-variance or correlation. If correlation exists in a model, the model has to be adapted to accommodate this dependency of input variables. In simulation models, functions are provided by the software (such as Crystal Ball  or @Risk ) to incorporate correlation and calculate the output variables accordingly. The major drivers for the test project were determined using the model. The effect on the output of the financial model is shown in a tornado graph in Figure 8. From the information available to the project team, it was evident that the specific project was highly sensitive to operating and capital costs. These two areas therefore provided the focus for the project team in the next step of the process. With the information available to the project team, opportunities to decrease both the operating and capital costs were investigated and realised. The majority of these related to the operating costs. The operational cost aspects of the project were not initially in the project team's scope, as the project was a brownfield extension of an existing mine. Operating costs and mining strategies were therefore assumed to be similar to the existing facilities. However, once the client appreciated the importance of managing the uncertainties relating to the operating costs, this was included in the project team's scope. The project was then re-evaluated using the model, and the revised input constraints as defined and modified through the technical solutions were incorporated. To assess the accuracy level of the overall project study, the capital cost estimate and implementation timing were depicted using S-curve profiles obtained through a simulation. The project team also developed NPV and IRR distributions using Monte Carlo simulations. Monte Carlo simulation (MCS) techniques for decision-making in projects have been developed and used for the more than two decades since the software became available on desktop computers. Naeini & Heravi  used MCS in conjunction with earned value methods to develop probabilistic forecasts for project costs at different stages of the project. Savvides  used MCS to analyse and assess risk in investment projects. Risk assessment for operations or projects is generally not done by individuals, due to the risk perceptions of individuals. It is recommended that the allocation of probability (or likelihood) and consequence (or impact) values should be done by a risk team that comprises different individuals from a variety of disciplines and hierarchical levels in the organisation or project. In a similar way, the estimates for the parameters of a probability distribution that are used for uncertain cost values - such as triangular distribution, lognormal distribution, or normal distribution - should be estimated by a risk team that is assembled for this special purpose. Certain cost and revenue values for the project can be estimated from similar projects that have been completed. Average costs and standard deviation values can be determined for a number of past projects, and then used for the parameters of the normal distribution after adjustment for inflation and exchange rate fluctuations. For new projects, the risk team would not have historical data to use to allocate the parameters of the distributions, and could have recourse to the method of expert elicitation. Expert elicitation is defined by O'Hagan et al  as "the process of extracting expert knowledge about some unknown quantity or quantities, and formulating that information as a probability distribution". A discussion of elicitation techniques is beyond the scope of this paper, but a thorough treatment of the subject is provided by O'Hagan et al. and Clemen .. 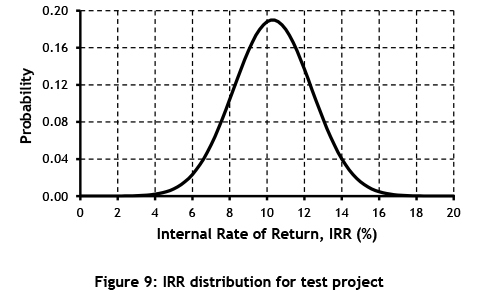 Using the input parameters of the cost and revenue distributions as estimated by the project team, the output probability distribution for the internal rate of return (IRR) for the study project is shown in Figure 9. The output of a Monte Carlo simulation is typically a probability density function (PDF) - as shown in Figure 9 - as well as a cumulative distribution function (CDF). From these distribution functions it was determined that this specific test project had a 29 per cent probability of exceeding the client hurdle rate of 11.5 per cent for IRR. The project therefore had a 71 per cent chance of providing an IRR of less than 11.5 per cent. The project was then evaluated against the criteria specified by the client, and found not to be within acceptable levels. This required the project team to restart the process and to define the project deliverables further. The project returned for a second time to the review step, and found it to be within acceptable levels for a pre-feasibility study. The study did, however, indicate that the project should not progress to feasibility phase, as the probability of exceeding the required hurdle rate was low, and the mean expected net present value (NPV) was -R348 million. Brainstorming and document reviews were mostly used as identification techniques during the three project phases. Flow charts were also used by a number of projects, but only for feasibility studies. 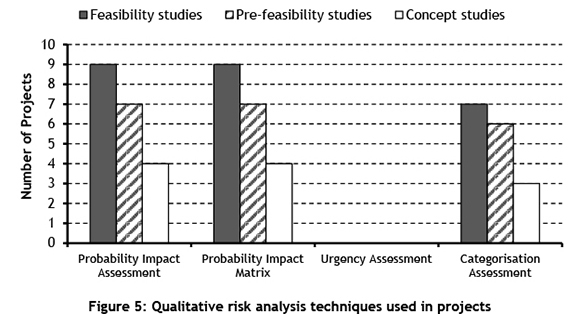 Three of the four qualitative risk analysis techniques that were presented to respondents were used on the projects during all three project phases. The expected monetary value (EMV) technique was mostly used by the projects during the feasibility studies project phase. Risk simulation and decision analysis were only used by two projects each. Opportunities were rarely identified in these projects. These results indicate that project teams for the 20 projects used only a few of the tools and techniques that are available for risk identification, qualitative risk analysis, and quantitative analysis. This is an indication that uncertainties - in particular, possible opportunities - that relate to typical mining project studies are not well understood or managed. Brainstorming is a quick and effective technique for identifying risks and opportunities, but the sessions were mostly held later in the project phase, and so could only impact the next phase. Even though the proposed uncertainty management process was used for the test project, it did not progress to the next project phase. The process could, however, be viewed as a success. The project study was completed substantially faster (about 30 per cent) than originally expected. This turnaround time should improve with future project studies, as there as a substantial learning curve throughout this initial process. The alternative method of presenting the project data was also well accepted by the client organisation, even though some additional explanation was required. A reduced project study time and reduced study costs can be expected if the proposed uncertainty management process is applied. The process does not require many additional resources, but the project team should explore other methods of risk and opportunity identification in addition to the brainstorming and document reviews. However, it should be remembered that study costs are a direct function of the percentage of engineering design completed for the study. For some project studies, therefore, the cost might not reduce significantly, if at all. The uncertainty management process could also help to decrease the possibility of project teams being too optimistic, thus enabling them to deliver more realistic estimates for project outcomes. Many large projects use project risk management as an integrated sub-process of project management to deal with uncertainties in the project environment. The intent of the PMBoK guide was that risk management in a project should not be an add-on, but an integrated process. However, risk teams do not always implement risk management as a priority, and the outputs of such projects often suffer the consequences, being completed late or over budget. The proposed uncertainty management process was tested on only one project. It should be implemented on more mining projects, and further refined and developed if needed. The process could improve the outcome of mining projects, and could be implemented in other industries if it is found to improve project outcomes and to be cost effective.